Christmas is less than 2 days away. If you haven’t finished your shopping, don’t panic! We’ve got a few DIY ideas that everyone on your list will appreciate and you can put together in a flash. Personalized Mug. 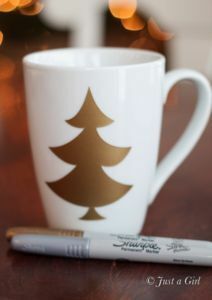 Grab a plain light-colored porcelain mug (you can snag these at Goodwill for less than $1 each) and a few Sharpie paint pens. Ensure your mug is clean by using rubbing alcohol and then unleash your creative side. Write an inspirational quote, inside joke or draw a funny doodle. You can use rubbing alcohol to erase any mistakes. Once you’re happy with your creation, put the mug in a cold oven and heat to 425 degrees. Bake for one hour, let the mug cool completely in the oven and you’re done! 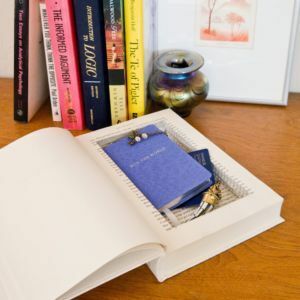 Secret Stash Book. Head to your local Goodwill or used book store and pick up a book (you’ll want one at least 3 inches thick) to upcycle into this clever secret compartment that will help keep important items hidden. This project will take a bit of patience and elbow grease but the end result is worth it. We like this tutorial from PopSugar. Chalkboard Serving Tray. Ideal for the hostess on your list, this elegant serving tray is an easy and fool- proof project. 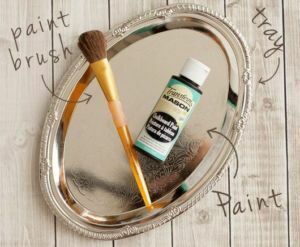 Pick up old metal trays and some chalk board paint. You can make this project go even faster using chalk board spray paint. You can choose to paint the entire tray or just the center area, leaving the shiny metal around the edge. Let it dry and you’re done! Make sure you include some chalk with your gift for writing what’s being served or including fun messages. These are great for anything from cheese to champagne and the best part is, they can be changed up for any occasion. When you shop at Goodwill, you help people in your community go to work — the best gift of all!